Assessing Critical Thinking in Elementary Schools: Meeting the Common Core [Rebecca Stobaugh] on Amazon.com. *FREE* ... Assessing Critical Thinking in Elementary Schools and over one million other books are available for Amazon Kindle. .... Making Sense of Secondary Science: Research into children's ideas. 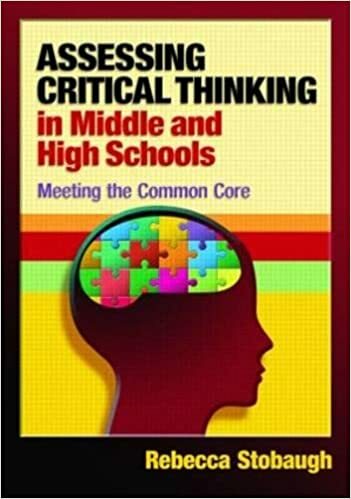 AbeBooks.com: Assessing Critical Thinking in Middle and High Schools: Meeting the Common Core (9781596672338) by Rebecca Stobaugh and a great selection of similar New, Used and Collectible Books available now at great prices. Assessing Critical Thinking in Elementary Schools: Meeting the Common Core : Rebecca Stobaugh | Critical Thinking -- Study and Teaching (Elementary) | 370.152 Sto. Find great deals for Assessing Critical Thinking in Middle and High Schools : Meeting the Common Core by Rebecca Stobaugh (2012, Paperback). Shop with confidence on eBay!